Bob Bryan is an American male professional tennis player. 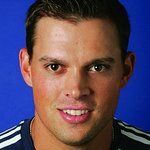 With his twin brother Mike Bryan, he has been a World No. 1 doubles player for the last several years. Google trends for "Bob Bryan"
We don't have any videos related to Bob Bryan.